"My head was muddy. I was only half awake. I needed to pee. I had to get warm. I rose and floated to the bathroom through the dark, the smallest blanket thrown over my shoulders to keep the cold off. I had the sleep-addled idea that I was still balled up to stay warm, with my knees close to my chest, although I was nevertheless moving forward. It was only when I was over the toilet, fumbling with the fly of my boxers, that I happened to look down and saw my knees were hitched up, and that my feet weren't touching the floor. They dangled a full foot over the toilet seat." 20th Century Ghosts is an anthology of short stories written by Joe Hill - his first works gathered together and published as a collection. 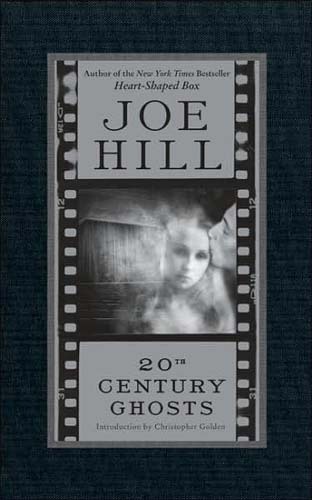 I already read, enjoyed and reviewed his two other novels (Heart-Shaped Box and Horns), so when I reached for this book I more or less knew what to expect and I was very excited to find out if Joe Hill is as good at writing short stories, as he is at writing full length novels. And he is. He really is good. In 20th Century Ghosts one can find all sorts of short stories. Not all of them are horror stories, by the by. You can find some fantasy stories here, some skillfully written supernatural as well as disquieting mainstream one. Each of them is a masterpiece of some sort. If I were to chose my favorite one of them, I honestly think I would spend the whole life deciding, they're all really amazing, captivating and breath-taking. Joe Hill managed to write really thrilling and unsettling stories without making them horrific or gruesome. As Christopher Golden said in his introduction to Joe Hill's book, "Most of those who practice the art of the unsettling far too often go for the jugular, forgetting that the best predators are stealthy." Well, it's hard not to agree with him, right? In this case however you don't have to worry about the jugular at all, Joe Hill has more than one trick in his bag, he knows exactly which strings to pull to make his readers scared, he's elegant and even tender in his writing, oh-so-very subtle, one stealthy predator indeed. I was deeply impressed by Hill's writing style. The stories he tells are deep and engaging, they resonate deeply. His purpose is not only to scare his audience, but to give them the opportunity to actually feel the story, providing the emotional response necessary for the story to really be successful. I enjoyed every word, for every word in this book had a meaning. There was no pointless blabbing, no long and useless description, not a single page was a waste of paper and ink. Every story in this collection was like a strong punch in the jaw, delivered by highly trained fighter of words. By the end of the book I was totally knocked down, left gasping for air, wanting more.. Sounds like this one is another interesting read in the making. May have to check it out. Thanks for sharing...and happy reading! LOVE Joe Hill. This is one that I haven't read yet. Great review. This one is on my to-be-read shelf and after reading (and loving) Heart Shaped Box, I'm looking forward to it. Great review! I haven't read any short stories in a long time. I'd like to read some, and these look good. I've heard great things about Jonah Hlil. This book had me at the cover...even before I read the review! I would LOVE to read this one. Thanks for showing me something new! I actually ran into this book at Borders before it closed down and as intrigued, so I had to buy it. I haven't read any of the stories yet, but I'm really looking forward to reading them. I'll definitely be looking out for this author as well. Thanks for the review! Ghosts don't stop at scary; they can move on to poignant, heartbreaking, and even cathartic! That's what came to mind when I read the part of your review where you observe that Hill gives us a chance to feel the stories and not just to be scared. The premises sound creepy and sinister enough to stand on their own, so it will be very interesting to see what else he has done with them in his stories!